Four-time Oscar®-winning filmmakers Joel and Ethan Coen (“No Country for Old Men,” “True Grit,” “Fargo”) write and direct Hail, Caesar !, an all-star comedy set during the latter years of Hollywood’s Golden Age. Starring Josh Brolin, George Clooney, Alden Ehrenreich, Ralph Fiennes, Jonah Hill, Scarlett Johansson, Frances McDormand, Tilda Swinton and Channing Tatum, “Hail, Caesar” follows a single day in the life of a studio fixer who is presented with plenty of problems to fix. 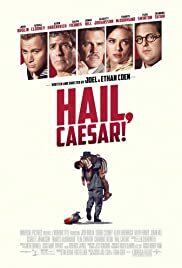 Hail, Caesar!” is overpopulated with scenes that don’t work to further what little plot is here, and with such a high-stakes story about a lead actor being kidnapped by a band of communists, Clooney’s Braid Whitlock doesn’t seem too phased, Brolin’s Mannix, who has never been a particularly strong actor to show real emotion or gusto in his personals, doesn’t seem too concerned, so what is there left for us to care about? Some comparison has been made between both “Hail, Caesar!” and Wes Anderson’s “The Grand Budapest Hotel,” and while the two have a similar approach to dry wit and deadpan humor, as well as similar actors like Fiennes and Swinton, Anderson’s picture was a perfect example of copious energy and exhilarating, rapid-fire comic exchanges. “Hail, Caesar!” is the exact opposite; a frequently dull and almost entirely uninteresting film, predicated upon the strength of a few great scenes and some decent, albeit far, far too short, performances in a thoroughly muddled picture.